Tagging on blogs can have multiple benefits. The first is, if your blog is searchable, the tags prove to be a way for readers to find like content. For example, on this blog (built on Drupal), if you click on a single tag it will return all results that match that tag. My next few posts will deal with tagging on different social networking sites. This first tutorial will focus on Flickr. As some of you may already know, on May 25th there will be a 24-hour conference: the Second Life International Education Conference: Best Practices in Teaching, Learning, and Research. Nonprofits may each have a 6X6 booth with a 25 prim allowance for free. I just got word that Infinite Vision Media is launching a Social Responsibility Initiative, an effort to allow non-profit and academic institutions to benefit from Infinite Vision's SL marketing and networking expertise. IVM's is launching this new initiative at the same time that they announce the creation of the American Cancer Society's headquarters in SL created by IVM. I would like to invite you to this fun event during 1st week of May, 2007. Featured events of educational classes, product demo, book reading, video stream/footage of the US legendary rock bank Journey will happen on May, 5th and May 6th. With over 40 of the most dedicated exhibitors ranging from businesses to nonprofit groups, RL musicians and artists to educational groups, this is a great opportunity to network and to see what you haven been missing in SL in a friendly and professionally designed building of Joysco Convention Center. Located on region/sim name: Convention Center. I hope everyone is celebrating Earth Day in their own special way today. There are a bunch of cool activities going on in Second Life that you can find here. 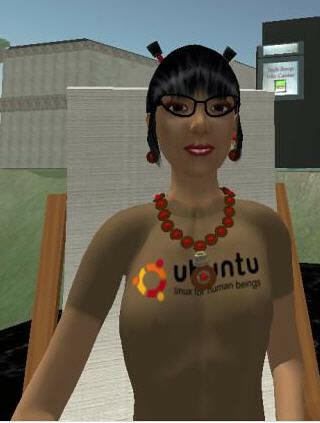 At today's Nonprofit Commons meeting, someone gave me an ubuntu t-shirt. I couldn't resist adding to my t-shirt collection. Tonight Frank gave a group of us a turorial on how to manage the land in our little community. Having never thought about what goes into managing a sim before, I was impressed by how well thought out the system actually is. I'll probably start out by using WESTAF as a guinea pig to reset the name and so forth, but once I've got it under my belt let me know if you, a tenant, needs help. I'm happy to see what I can do for you.